It’s not easy trying to fit in writing when our lives are taken up with other things but, if the urge is strong, it will find a way through whoever you are and whatever your circumstances. This was certainly my experience. I have always written – from scribbled secret poems in teenage notebooks to completing an MPhil in Creative Writing at Sussex University in 2014. Now, in the autumn of 2016, my debut novel, The Handsworth Times has been published by brilliant independent publishers, Bluemoose Books and I am delighted. This probably sounds like a pretty smooth trajectory on the surface but it won’t surprise many to know that it has, in fact, been a long and fairly unpredictable journey with a few significant factors along the way. To start at the beginning, I grew up in the 1970s and 80s in a British-Asian family in Handsworth, Birmingham. Handsworth is an inner-city area typified by diverse communities; where adults share similar economic deprivations but generally live culturally segregated lives whilst their children play out alongside neighbours of all backgrounds, sharing popular youth and music culture. Growing up, I was surrounded by people written off by the education system and/or struggling to make ends meet but these particular personal experiences were never ones I came across in books I read. There are two things here that are fundamental to my journey as a writer. Firstly, it soon became apparent that practical circumstances meant being a writer was not going to sit high on any priority list. Secondly, Handsworth was an extremely lively and exciting place to grow up in, full of untold stories that never seemed to get written about. 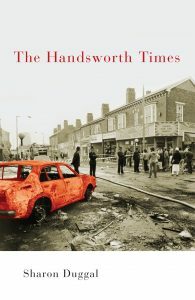 Practical circumstances slowed down my journey as a writer but the creative urge is not something that can be stalled indefinitely and the compulsion to write about the sorts of people I grew up around – immigrants, working class communities, and strong women – finally won the day, culminating with my novel, The Handsworth Times. In the early 2000s, I was working at Centerprise Literature Project in Hackney surrounded by a broad range of readers and writers. I had very young twins at the time and not very much energy or time but just being around other writers gave me the confidence to take my own writing more seriously. I was on maternity leave with my third child when my twin boys started school and it was then I had a bit of a ‘now or never’ moment so enrolled on a short online course with the University of East Anglia. A great teacher called Lisa Selvidge led the course and to pass we had to produce a short story at the end of 10 weeks and submit for competitions. I was gobsmacked to find my story was a runner-up in the Decibel-Penguin Prize for Short Stories that year. My prize was a manuscript assessment from The Literary Consultancy and this was a hugely significant moment for me. The feedback from novelist, Cynthia Rogerson was very constructive and she said some really very nice things about my writing style. It was the first real validation that my dream of being a writer might not be totally unrealistic after all. After that I starting allowing myself to believe that writing was something I could and, importantly, should do. It wasn’t smooth sailing after that. We relocated as a family and finding paid work and bringing up the kids was definitely the priority for the foreseeable future. I started the MPhil as a way of giving myself a structure for fitting writing in to everyday life and I started the novel as a result. Following a wave of disheartening rejections from competitions, call-outs and agents, I made a conscious decision not to submit to anywhere until I had finished the whole book. That was until I saw a call-out for submissions by unpublished writers for the Writing the Future report, commissioned by Spread the Word to explore the lack of diversity in UK publishing. This was something I felt strongly about and had covered in my MPhil thesis so I sent in a short extract of The Handsworth Times and it was included. The publisher got in touch soon after that and asked to see three-chapters and a synopsis. I hadn’t actually finished the book at that stage so they told me to get back in touch when I had. Six-months of frantic writing and a bad bout of tennis-elbow later, the publisher offered me a contract based on the full first draft. I feel incredibly privileged to now be able to call myself a published author. It hasn’t been a straightforward journey but I hope others will take some inspiration from the fact that I got there in the end! Sharon Duggal was born to parents who immigrated to the UK from the Punjab, India and she grew up in and around Handsworth, Birmingham. She lived in London for many years and now lives in Brighton & Hove. She is a writer, campaigner, community radio presenter (alongside one of her sons), a daughter, sister, mother and partner, amongst other things. She works in arts and literature development and has an MPhil in Creative Writing from the University of Sussex. The Handsworth Times, published by Bluemoosebooks.com, is her first novel.